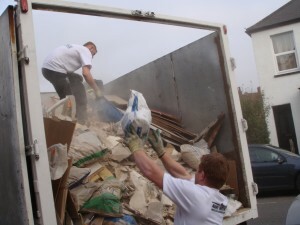 Do you have building or DIY waste you need to get rid of in Leytonstone? We have the answer! Away With It supplies builders waste removal Leytonstone building companies and DIY enthusiasts alike rely on for flexibility and convenience at affordable prices. What’s more, we reuse or recycle 80% of waste after removal. And because we’re fully licenced waste carriers our customers can be confident that anything we can’t recycle will be properly disposed of. We’ll use our own dust sheets if we need to transport any DIY or builders waste through your home during removal. And we will also give the place a good sweep and tidy before we leave too. We work seven days a week, from 7am till 11pm. Just call us up and let us know where in Leytonstone/E11 you live and we’ll give you a two hour time slot on a day of your choosing – there’s no need to waste a whole day of annual leave waiting for us to call. An hour before we’re scheduled to visit your home, we’ll call you to confirm our arrival time. We offer a free, no obligation quote, which includes all labour, transportation and disposal fees for our DIY and builders waste disposal service. There won’t be any nasty surprises at the end of the job! And because we will only ever charge you for the space your DIY or builders waste uses in our van, we’re confident you’ll like our prices. 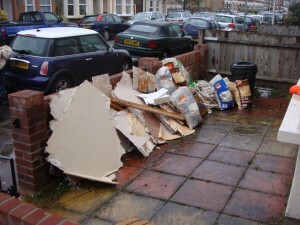 To book builders waste removal in Leytonstone E11 just give us a call on 0208 504 7390 or 07957 123019. Or fill out our handy online form for a quick and easy no obligation quote.